One of my favorite companies to talk to and keep track of is Cumulus Networks, makers of Cumulus Linux, a network operating system that runs on whitebox switches. As I’m not in a build phase on the network I do most of my work on, I haven’t had a chance to try Cumulus Linux out, but they are someone I’m quite interested in. Why? 1. Choice. I like that Cumulus Linux + whitebox means I can mix and match my hardware and NOS according to my needs. I don’t believe in vendors as much as I believe in networking. These days, I want choice. 2. Economy. Vertically integrated networking stacks (inter-dependent hardware and software) means I’m locked into more or less whatever the vendor wants to charge me. If I want the NOS, I need the hardware, and if I want the hardware, I need the NOS. That means the network hardware business has been very high margin for a very long time. Even when buying at something like 50-60% off of so-called “list price,” the big name network vendors make big profits. And more power to them, because capitalism. But also because capitalism, there’s room for a disruptor in the space, and I can argue that Cumulus is leading this particular charge. 3. Automation. Cumulus Linux is really and truly Linux. That lends itself to integration in a wider automation scheme, on the assumption that you are a Linux shop doing automation already. Realistically, you may or may not be. Microsoft Windows has a huge play in the server world; I recognize that. But doesn’t managing your network gear with the same tools you manage the rest of your server infrastructure with sound appealing? It does to me. Two bits of news on the Cumulus front. 1. Cumulus Linux 2.5 released. I’ll be honest. I’ve only glanced through the release notes so far. But I’m just happy to see progress. New releases of any product mean, at the very least, that bug fixes are happening. But more likely (and the case with Cumulus Linux 2.5), new features are also being added. Either way, that means people are using the product. And *that* means this whole whitebox switching movement has legs. As well it should. New features or feature enhancements in 2.5 include MLAG, a new driver for VLAN-aware bridging (allowing for a single instance of STP) that allows scale as high as a tested 2,000 VLANs, and enhanced routing for leaf-spine based IP fabrics. 2. 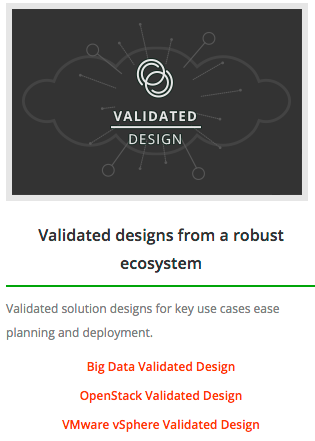 Cumulus offers validated design guides. 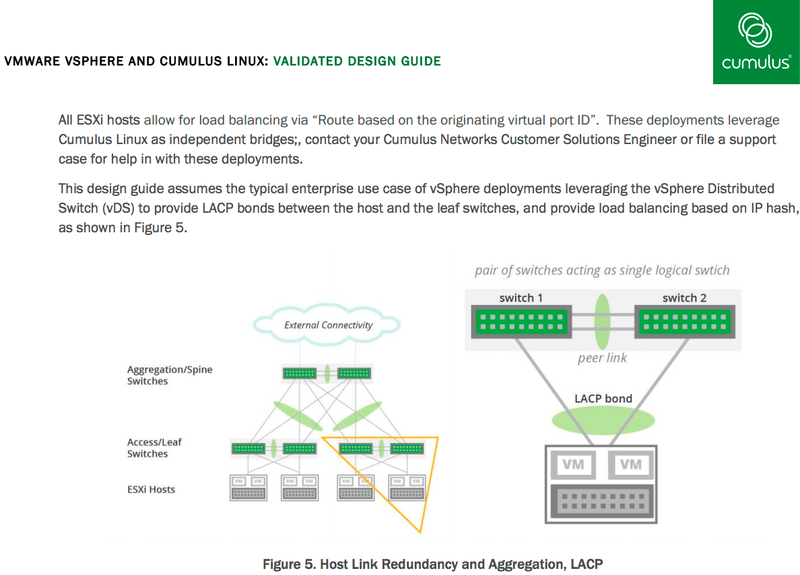 I saw a tweet yesterday about a newly released Cumulus Validated Design Guide for VMware vSphere, and then discovered some links at the bottom of the Cumulus home page. I have poked at the Cumulus VMware vSphere validated design guide (PDF, no regwall, they’re doing it right), and found it reminiscent of Cisco design guides. In the beginning of the guide, the overall scenario and challenge is described along with the accompanying major technical concerns. There’s a healthy supply of high-level diagrams. Then the detailed deployment suggestions commence, along with screenshots and specific configurations recommended to create the reference design. Sample from the design guide. During the admittedly brief overview I took, I observed that this guide assumes MLAG uplinks using LACP for vSphere hosts, 802.1q, a leaf-spine topology, and IPv4. There is also a lengthy section on automation possibilities to provision the Cumulus gear, including guidelines for ZTP, templating with Mako (will have to look into that one), Ansible, and Puppet. i am pumped for 2.5! and excited about cumulus. It’s disruptive to the networking industry. It’s very exciting to see the progress being made by Cumulus. At the end of the day, the industry won’t be totally one (vertically integrated) or the the other (white box). There is value in both. I’m writing this comment on an Acer Chromebook. It is very specifically designed to be a Chromebook and that’s why it’s working great for me. Many large enterprises will be very conscious about things like this. While more cost-conscious organizations will surely be very open to a whitebox solution.